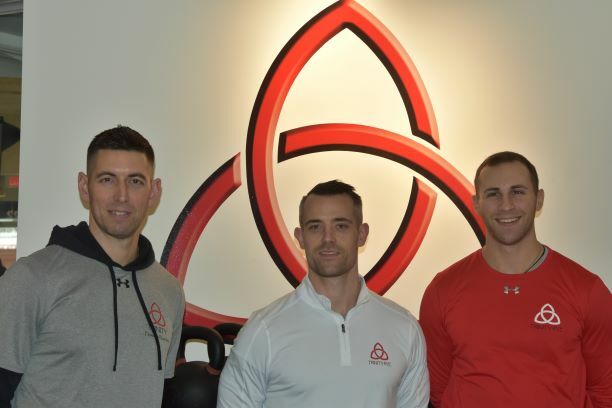 How does a fitness studio celebrate its 10th anniversary? In the case of Rye Health & Fitness, the answer is by opening another studio in downtown Rye. What the trio had envisioned is already occurring — high school athletes are coming in after school for 50- to 55-minute sessions. “We don’t just write out the workouts, but rather help these young athletes with different movements every time. We mix flexibility in with strength-training,” notes Georgio, the head trainer and manager. They’ve all studied nutrition and live it. Doody, who was an Infantry Scout Platoon Sergeant in the U.S. Army for eight years, said he received a complete education on performance in the military. The studio is actually named in memory of a soldier he deployed within Afghanistan. New clients are put through a functional movement screen and are given a body composition breakdown. Trinity has brought on a nutritionist who follows Dr. John Berardi of Precision Nutrition’s best diet principles. They ask about your habits, sleep cycles, and water intake. They live by their motto: Everyone can be an athlete. On January 27 at noon, Trinity is offering the first of many nutrition seminars. Meanwhile, stop by Trinity pretty much any hour of the day on weekdays. Trinity is open Monday through Thursday from 5 a.m. to 8:30 p.m., Friday from 5 a.m. to 7:30 p.m. and from 7 a.m. to 2 p.m. on weekends. If you have the MINDBODY App, you can check out their programs, or call 481-4413.